Kurozu (black vinegar), sometimes also known as brown rice vinegar, is produced and consumed in Japan as a health tonic. Black vinegar is believed to have been introduced to Kagoshima, Japan from China some 200 to 300 years ago. In China, black vinegar is typically made with black glutinous rice (also known as gsweet riceh), although millet or sorghum is occasionally used. In Japan, however, producers of black vinegar need to adhere to certain label requirement standards. In 2003, the Agriculture, Forestry and Fisheries Ministry in Japan issued a set of standards, which dictated black vinegars need to be made with at least 180 grams of brown rice per litre in order to be labelled as gblack vinegar.h Pundits believe the popularity of black vinegar as a health drink took off after this new ruling. Made from unpolished rice, the fermentation process for black vinegar takes anywhere between one to three years. Because of this long and complicated fermentation process, it develops a subtle, nuanced aroma. The flavour is not as intense as rice or grain vinegars, and has a hint of sweetness. During its fermentation period, the amount of vitamins, minerals, and amino acids increases, contributing to its high nutritional content. One of the reasons for the popularity of black vinegar is the belief that it helps with weight loss. According to a study conducted by researchers in Kyushu, black vinegar helps reduce the size of fat cells, known as adipocytes, in mice. The theory is, the acetic acid found in black vinegar triggers the production of proteins that help the body break down fat. However, unless this effect is reproduced in humans, it cannot be considered as a weight loss aid. Weight loss aside, the high nutritional content of black vinegar also contributes to a slew of purported health benefits. First, the high amounts of amino acids and other nutrients found in black vinegar act as a deterrent against the buildup of lactic acid in your blood. Having too much lactic acid in your blood can lead to fatigue, sore muscles, feelings of irritability, and disease. Black vinegar works to detoxify your body and balance out its pH level. Second, the warming nature of black vinegar can help improve overall blood flow and circulation as well as counteract against symptoms of high blood pressure. 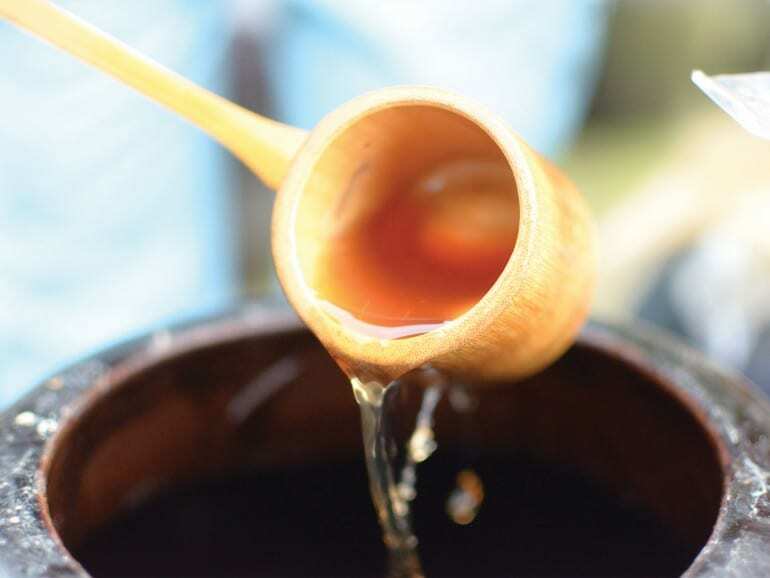 Finally, some people practice using black vinegar as a topical healant for disinfecting cuts, insect bites or as a skin dressing. Some people have even used it to help speed up healing for fractured bones, relieve pain from sprains, and even to treat athletefs foot.